Commuters ride a Metrobus rapid transit bus as night falls in Mexico City, December 2016. Could Mexico City be a model for our transportation woes? It’s no secret that the people of Massachusetts are concerned about the state’s transportation system. Lack of reliable and efficient transit options threatens business growth, limits economic opportunities, and diminishes our ability to respond effectively to climate change.The antiquated Boston transit system is without a doubt holding the city — and the state — back from economic opportunities and contributing to the region’s environmental crisis. Earlier this month, we took a trip to Mexico City with other business leaders that shed light on the potential to transform public transit as we know it. Spoiler alert: It calls for investing in the bus system. Mexico City has long suffered from notoriously poor air quality, primarily driven by vehicular emissions and worsening congestion issues, both of which threatened the city’s economic prospects. As a result of these troubling consequences, government officials, business leaders, and urban planners in Mexico City had to completely rethink their transportation ecosystem, and a Bus Rapid Transit system was a key part of the solution. In order to successfully implement BRT, planners in Mexico City tried to mimic a traditional subway route by developing dedicated bus lanes, preboarding payment systems, and multi-door boarding. They challenged the idea that streets are primarily meant for cars and revolutionized the city’s transportation network to prioritize cleaner and more reliable transit options, such as walking, biking, and public transit. The transportation problem in Mexico City was not easy to solve, and gathering input from many key stakeholders was a critical step in the implementation process. A project of this scale also required committed, passionate, and focused political leadership that sustained ups and downs and challenges of policy-making over a number of years. 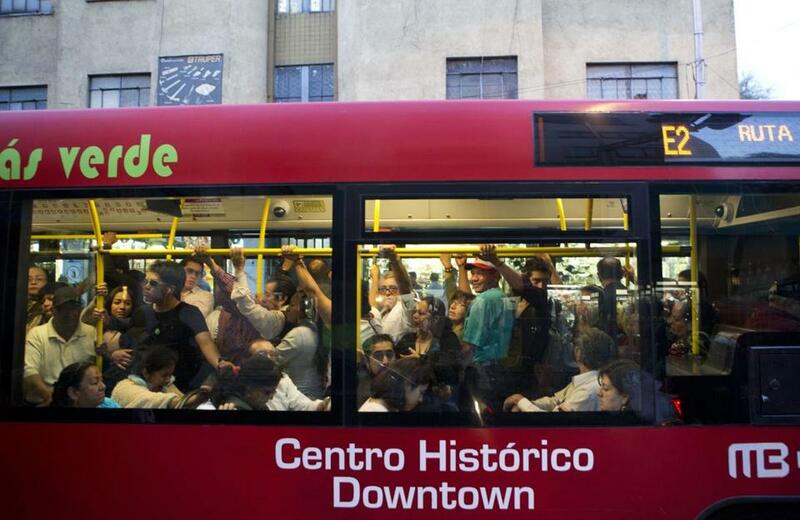 The efficiency of the Bus Rapid Transportation system in Mexico City was encouraging. It was clearly designed as a transportation vehicle “for the people,” focused on creating greater economic mobility for all communities while supporting public and private businesses with a qualified, accessible workforce to help them achieve their business goals. While our pollution issues today are not as severe as they have been in Mexico City, we are seeing the effects of global warming firsthand. But what is just as severe is the economic disparity our minority communities face in and around Boston. And an improved infrastructure will unlock higher paying, life-sustaining-wage jobs to these communities and in turn help the private sector attract a more talented and diverse workforce. As we saw firsthand, the results in Mexico City have been incredible. Over 70 percent of trips in Mexico City are completed using public transit, and only 22 percent are completed using cars, which results in commuters spending over 40 percent less time stuck in traffic. Businesses and housing are rapidly developing around these BRT lines, with energy-efficient buses contributing to a decrease in 110,000 tons of carbon emissions per year and fewer toxins polluting the city’s air. Meanwhile, here in Boston, only 34 percent of Bostonians use public transit to commute to work, and more than 45 percent rely on cars. This is unsurprising given our existing transit network. For example, commuting from Mattapan Station to South Station would require changing buses twice for a one-way trip that would easily take 1.5 hours. Alternatively, riders can cut their commute to roughly one hour by taking the 28 Bus from Mattapan Station to Ruggles Station and completing their trip by Commuter Rail for a notably higher fare. Neither are particularly encouraging options, especially when compared to the prospects in Mexico City of taking an affordable 30-to-40 minute BRT ride to work. Mexico City successfully demonstrated that planning around and investing in transit can protect the environment, attract competitive businesses, and improve economic opportunity and quality of life for its residents. We can learn from Mexico City’s experience and prioritize transit-oriented solutions such as BRT. It’s on us — stakeholders, policy-makers, voters — to break down the barriers associated with the bus and talk about shaping transportation — for the environment, and the economy. Our future depends on us being proactive today. Mexico City gets that. We should too. Massachusetts doesn’t have to reinvent the wheel — just recreate it. Emily Reichert is the CEO of Greentown Labs. Quincy Miller is the vice chair and president of Eastern Bank.